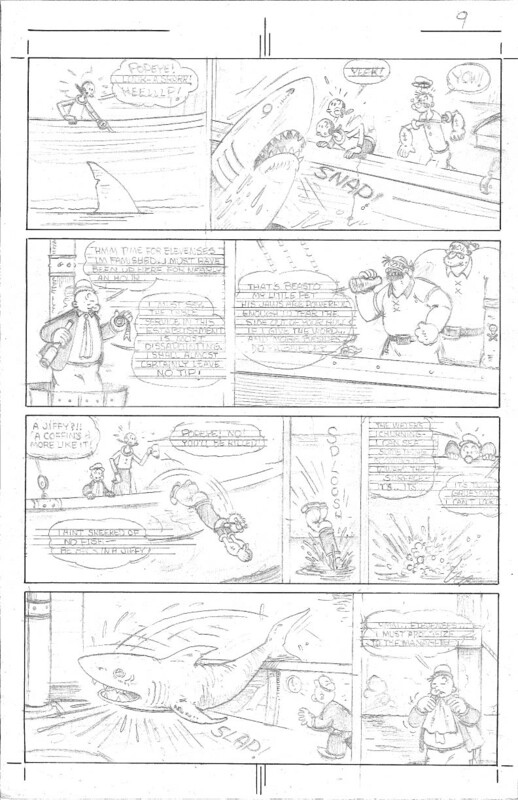 IDW's Popeye #1, edited by Ted Adams, Craig Yoe and Clizia Gussoni, is illustrated by Bruce Ozella, a Boston graphic designer and illustrator who has produced advertising concepts, brochures, cartoons, flyers, magazine and newspaper ads, pamphlets, posters, programs and PR materials during the past three decades. 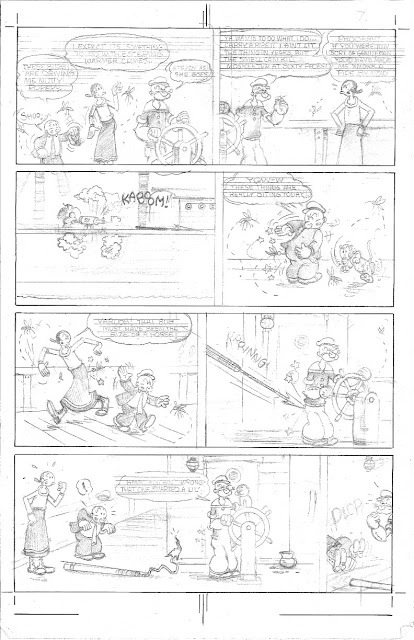 For Popeye #1, Ozella did all penciling, inking and hand-lettering. IDW received 11,569 preorders for Popeye #1 from comic retailers, prompting the company to print 13,400 copies. 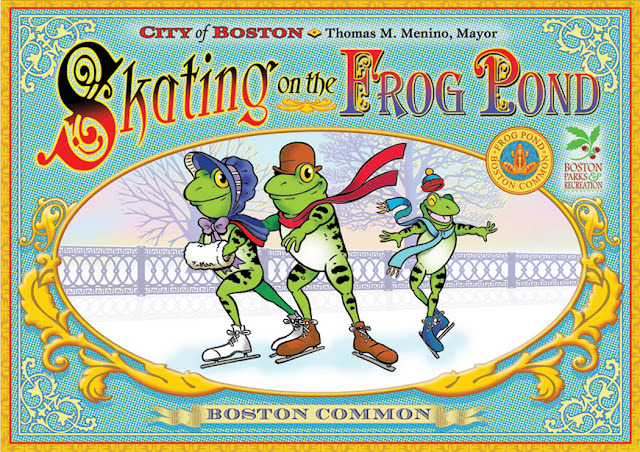 Those extra 2,000 copies quickly sold out, leading to a second print run. Popeye creator E.C. 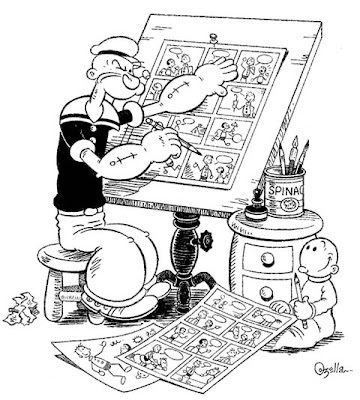 Segar was one of the funniest cartoonists of the 20th Century. 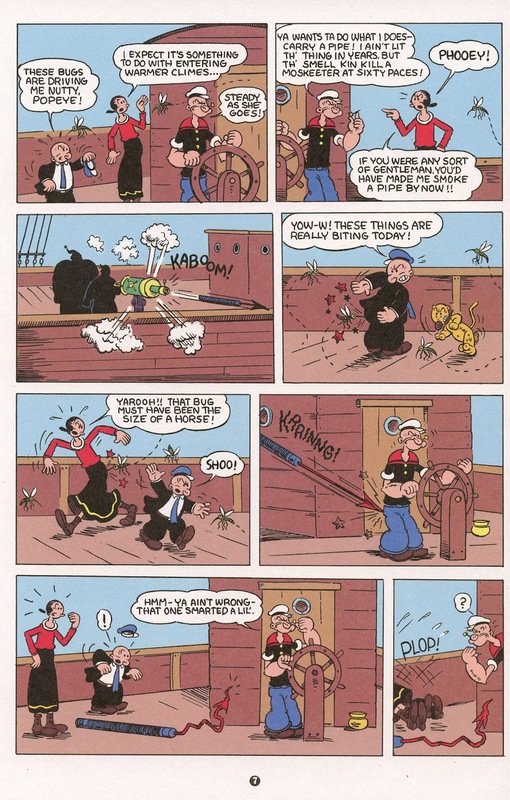 The new Popeye comic book, succeeds in capturing the spirit of Segar. 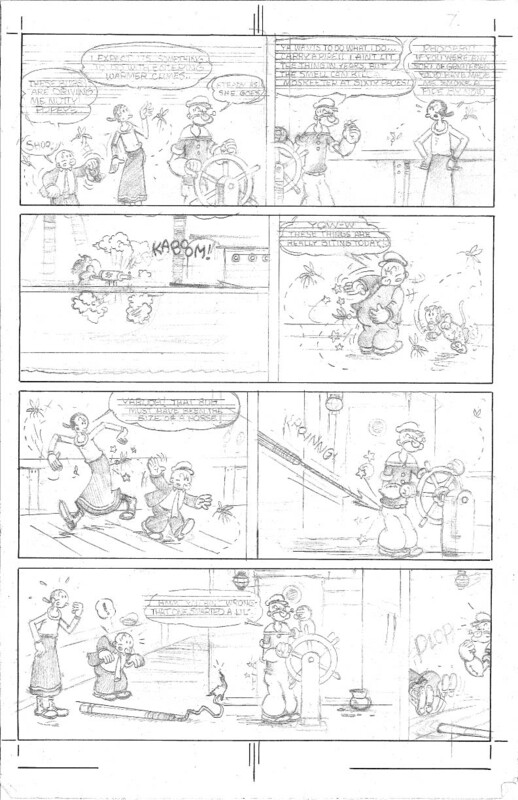 It's such an astounding, surprising success that the planned four-issue miniseries, according to scripter Roger Langridge, has already been upgraded to an "ongoing series" even before the second issue appears. To hear Langridge discuss this, go to the one-hour mark when you listen to The Orbiting Pod #65. 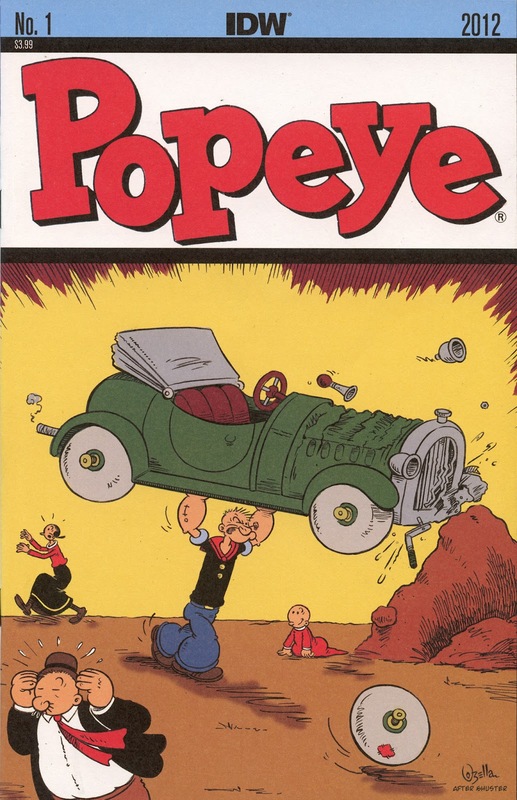 The second issue is illustrated by Tom Neely with a cover by Langridge. 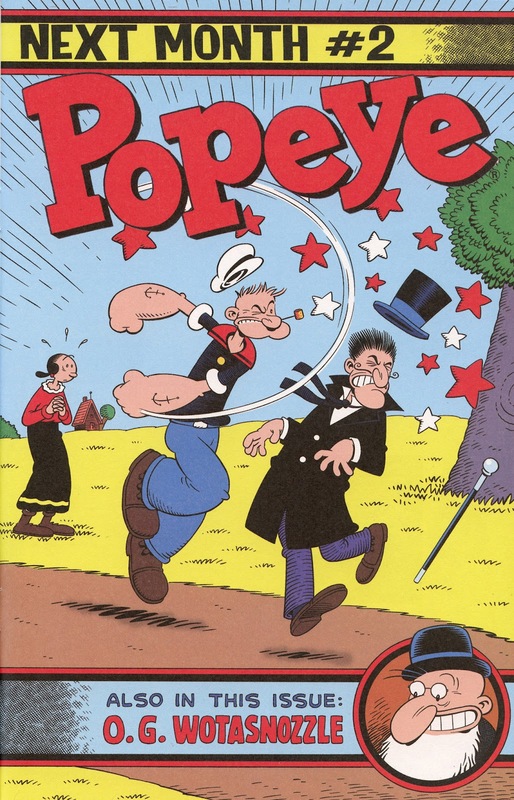 Langridge described the cast: "Things are pretty much as you would expect if you know your Segar: Popeye loves Olive, Olive loves Popeye in her own fickle way, Popeye is a devoted stepfather to Swee'Pea, Wimpy's always looking for a free meal, etc. It ain't broke, so we ain't fixing it. Olive's brother Castor and their parents, Cole and Nana Oyl, are a part of the mix too. And you may spot Olive's first boyfriend, Ham Gravy, at some point, if you keep your eyes open. Other familiar faces will pop up as well. 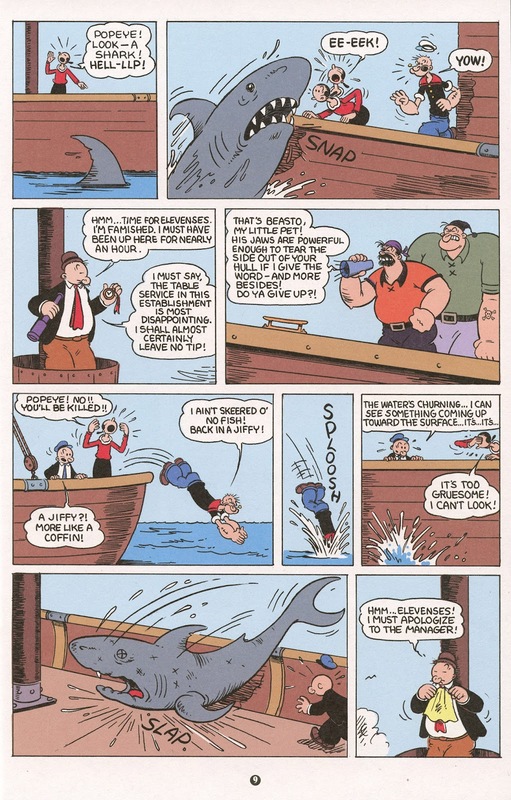 I've tried to get all of the regulars from the Segar years in there at some point, even if it's only a cameo." 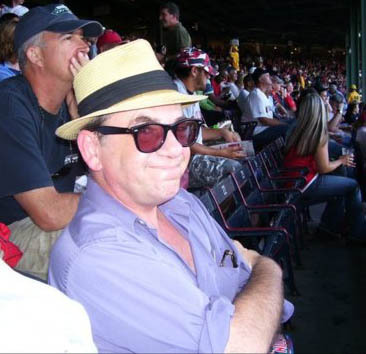 In rave reviews, Ozella has been described as a "dead-ringer for Segar" and "a great storyteller". 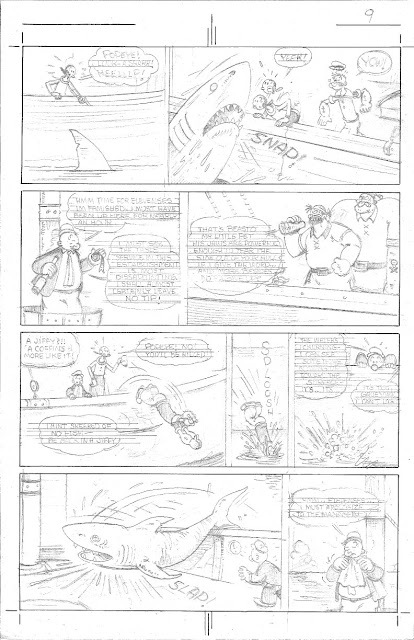 Pages seven and nine (below) reveal his working method and show slight changes and adjustments in some panels. That photo of this alleged Ozella character (at what I can only assume is some type of Sporting adventure) looks very similar to the one-eyed sailor hero himself.